13/4/2019 Cute little Darla is so happy that she has found her new home. Little darling Darla is urgently hoping someone will open their heart to her and give her a forever, retirement home. She is in the care of Foal Farm Animal Rescue in Kent who will only consider a home in the local vicinity for Darla due to her age. 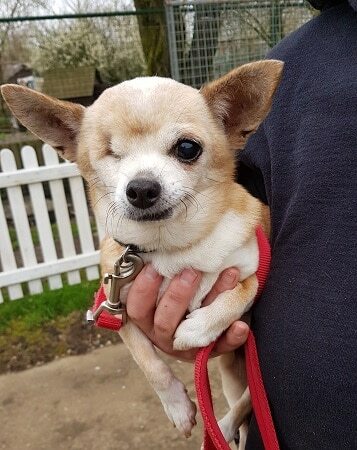 Darla is a cream and tan Chihuahua and she is 13 years old, so she would like a quiet home to enjoy lots of spoiling and love. Although Darla is in foster care with both dogs and cats, she is gaining her confidence and is quite naughty with them, so a pet-free home would be best. She is fine out and about with other dogs. Any children in the home should be older who know how to cherish a lovely, elderly lady. She is no trouble at all. Darla is spayed and vaccinated and waiting for you. Please mention that you saw Darla on the Oldies Club website.